Do you recognize any of the other girls in this photograph? Black and white negative showing the members of the May Court sitting on the steps of the loggia at the Ontario Ladies' College. 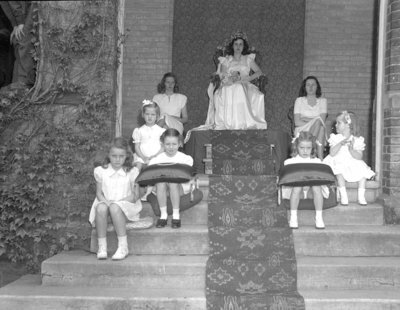 The Queen, seated in the middle on the top step, for 1946 was Darlene Cornell. Ontario Ladies' College May Day Celebrations, 1946, Marjorie Ruddy, Whitby Archives. 23-000-405.